We had some differences of opinion about the Leans Democratic states in the Midwest and the Northeast, as well as a handful of states that typically go Republican. For instance, we considered starting Pennsylvania and Wisconsin as Toss-ups to reflect how close they could be in a tight national election. However, given that both states have voted Democratic even in years when the Democratic nominee has lost (2000 and 2004), and because neither state has shown a clear pro-Republican trend in recent presidential elections, we could not justify portraying either state as a coin-flip to start. 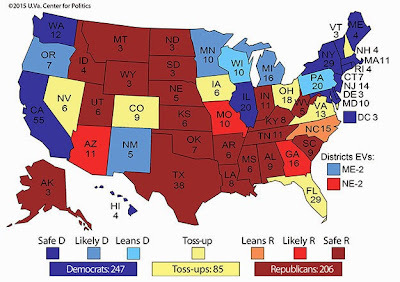 We also debated what to do with Arizona, Georgia, and Missouri, states that have consistently voted Republican presidentially since 2000 yet have yielded very close results (Missouri) or have demographic trends favoring the Democrats (Arizona and Georgia). They are certainly not Safe R — or not the way they used to be, at least in the case of the latter two — but if the GOP nominee is losing any of them, he is almost certainly on his way to a large national loss. Therefore, Likely R is the logical place for them. Indiana was easier. Barack Obama’s 2008 win was something of a fluke; it was only the second time since the end of the World War II that the state voted Democratic, and Mitt Romney strongly restored it to the GOP column in 2012. So we’ve started it as Safe R.
There's a ton of historical data at the link.